August is here and with it comes some of our favorite Niagara Falls activities, including the Niagara County Fair! August is a beautiful time in Niagara Falls, the days are warm and sunny and the nights bring the cool crisp fall air. It's a great month to enjoy some of the many festivals and events during the day, then when the sun goes down grab a blanket and enjoy a movie on Old Falls Street. This Tuesday head to Artpark to see The Machine perform Pink Floyd. The Machine, America's top Pink Floyd show, has forged a 20 year reputation of excellence, extending the legacy of Pink Floyd, while creating another legacy all their own. Their use of expanded theatrical elements and elaborate stage displays continue the spirit of the later Floyd lineups. Gates open at 4:15 pm and the show starts at 7:15 pm. For tickets and more information CLICK HERE. 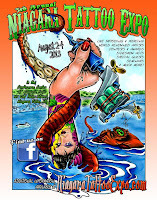 The 2013 Niagara County Fair is coming together to be better than ever! More than just fun rides and fair food, the Niagara County Fair has lined up performances by 7th Heaven, 90 West, and Craig Wilkins. There will also be magicians, dancers, clowns, and a daily show by Air Mutts - K9's in Flight. Come and experience jazz at it's finest in an intimate and relaxed outdoor concert setting at the Gazebo at Hennepin Park. The Lewiston Jazz Project is a seven-piece group, under the direction of composer / pianist Ron Corsaro. This septet performs original as well as classic jazz repertoire, swing, and modern jazz, accompanied by guest artists and student musicians. The concert is from 7:00 pm - 9:00 pm and this is a FREE event! For more information CLICK HERE. 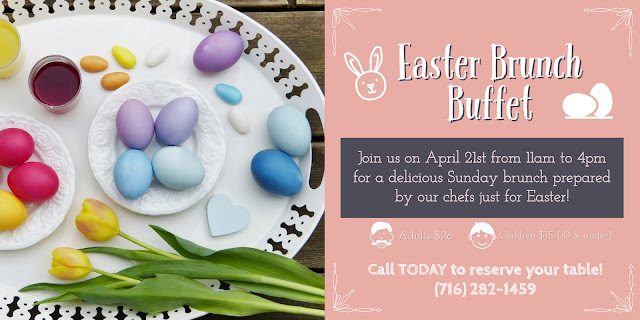 The Niagara Falls Culinary Institute is located on Old Falls Street in the heart of downtown and just steps from the beautiful Niagara Falls. Visit the Wine Boutique at the Culinary Institute on Thursday from 4:00 pm - 5:00 pm for free wine tastings. For more information CLICK HERE. Grab a blanket and share a bag of popcorn each Thursday night as Old Falls Street USA turns into an open air theater featuring classic and contemporary movies under the starts. Food and beverage vendors will be available every week. This Thursday come and see The Muppets at 9:00 pm in the Old Falls Street Middle Block. For more information CLICK HERE. Kick off the weekend with the area's finest classic rock and dance bands. This free concert series features food and beer vending with plenty of room to dance. Make sure to stay until 10:00 pm when guests are treated to fireworks launched over Niagara Falls. The party starts at 7:00 pm on the Middle Block, and this week's featured band is White Chocolate. For more information CLICK HERE. This year's 3rd Annual Niagara Tattoo Expo features a variety of diverse and distinctive nationally renowned artists. They also have an eclectic array of vendors and a mixture of entertaining indoor and outdoor events. Pre-sale tickets are $10.00 for a one day, $25 for the weekend. Door prices $15.00 for one day, $40 for the weekend. For more information CLICK HERE. Sundays from July 7th to August 25th Jazzy Sundays will e held from 2:00 pm to 5:00 pm on Old Falls Street's Middle Block. The annual live music series features performances by the region's greatest jazz, Dixieland, and big band musicians. The afternoon also features Encounter Niagara's historical reenactors in period costume. This series is pet-friendly, so bring your pooch and get ready for some fun. Each week our talented chef's create unique menu items to feature in our Weekly Specials, and whether your a seasoned regular or a first-timer you don't want to miss out on this week's scrumptious entrees. Special are valid July 26th through August 1st. Summer's here and so are all the exciting Niagara Falls activities! It's the time of year to listen to some music at one of the many outdoor concerts, or grab a blanket and lawn chair and watch a movie at Flicks over the Falls. Read below to learn more about What's Happening in Niagara Falls this week! Recipient of Blues Beat Magazine's prestigious "Muddy" Award, Blue Mondays return to the gazebo in Lewiston for its 19th year of great blues music. The event runs from 7:00 pm to 9:00 pm at the Hennepin Park Gazebo, Fourth and Center Streets. Considered by many to be one of the best Blues venues in Western New York, and according to the Lewiston Council of the Arts, it attracts a faithful following of blues lovers from all over. This is a free event and the featured performance this week is Ron LoCurto & the Reinhardts. Since the release of their debut album, Outskirts, in March 1987, Blue Rodeo has established themselves as one of the premiere bands in Canadian music history. Their 12th studio album, The Things We Left Behind, was released in November of 2009 and over the course of their career the group has sold over four million albums around the world. Tickets are on sale now. Gates open at 4:30 pm and the show starts at 6:30 pm. For more information CLICK HERE. The Niagara Falls Country Club, host of the 55th Annual Porter Cup is excited to Welcome and kick off another year's successful tournament. Each year, the tournament builds on the foundation laid down previously to reach new heights of excellence in amateur golf. The tournament is pleased to again have a collection of the world's best collegiate, international and mid-amateur golfers. Top players from the United States, Canada, Australia, New Zealand, Mexico, Argentina, Venezuela, England, and Finland will be vying to have their name engraved on the Alexander L. Porter cup. For more information regarding the tournament CLICK HERE. Grab a blanket and share a bag of popcorn each Thursday night as Old Falls Street USA turns into an open-air theater featuring classic and contemporary movies under the stars. Food and beverage vendors will be available every week. This Thursday come and see The Lion King at 9:00 pm in the Old Falls Street's Middle Block. For more information CLICK HERE. Kick off the weekend with the area's finest classic rock and dance bands. This free concert series features food and beer vending with plenty of room to dance. Make sure to stay until 10 p.m. when guests are treated to fireworks launched over Niagara Falls. The party starts at 7:00 pm on the middle block, and this weeks featured band is The A List Band. For more information CLICK HERE. 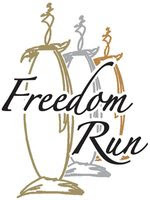 Drink wine and watch a movie at the Freedom Run Winery! Doors open at 8:00 pm and the movie will start at sunset. You can enjoy wine by the glass, and their will be specialty cocktails and gourmet snacks inspired by each week's film. The featured film this week is The Big Lebowski.. For more information CLICK HERE. The Sanborn Area Historical Society's free event is held on the museum grounds, 2660 Saunders Settlement Road, and runs from 8:00 am to dusk Saturday and 8:00 am to 4:00 pm on Sunday. Things kick off with a pancake breakfast at 8:00 am on Saturday, followed by opening ceremonies at 10:00 am. The Niagara River Dancers take stage from 11:30 am to 12:15 pm. There is a tractor parade, "Elvis" concert, and fireworks at 9:30 pm. For more information CLICK HERE. Sundays from July 7th to August 25th Jazzy Sundays will be held from 2:00 pm to 5:00 pm on Old Falls Street's Middle Block. The annual live music series features performances by the region's greatest jazz, Dixieland, and big band musicians. The afternoon also features Encounter Niagara's historical reenactors in period costume. This series is pet-friendly, so bring you pooch and get ready for some fun. 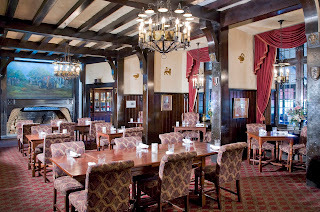 The Red Coach Inn is a unique Niagara Falls hotel unlike any other. I could go on and on about what sets the Red Coach apart from all the other hotels, but the focus of this post is for our followers to see a little about each room. The Red Coach Inn has only 35 rooms, and every room is different! From the layout to the decor to the view each time I stay I learn and experience something new at the property and I want to share, so when you are ready to stay you know exactly which room to pick! 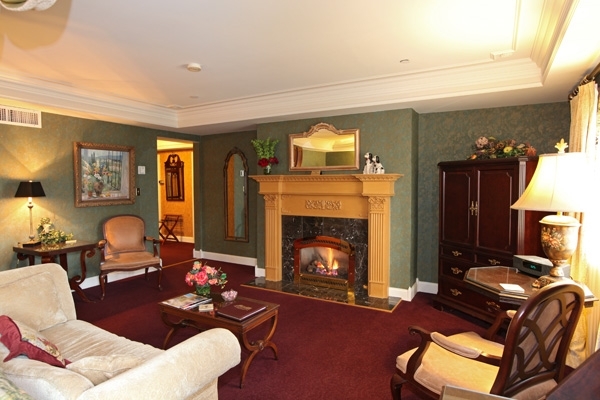 What makes the Sheffield Suite so popular with our new and repeat guests? 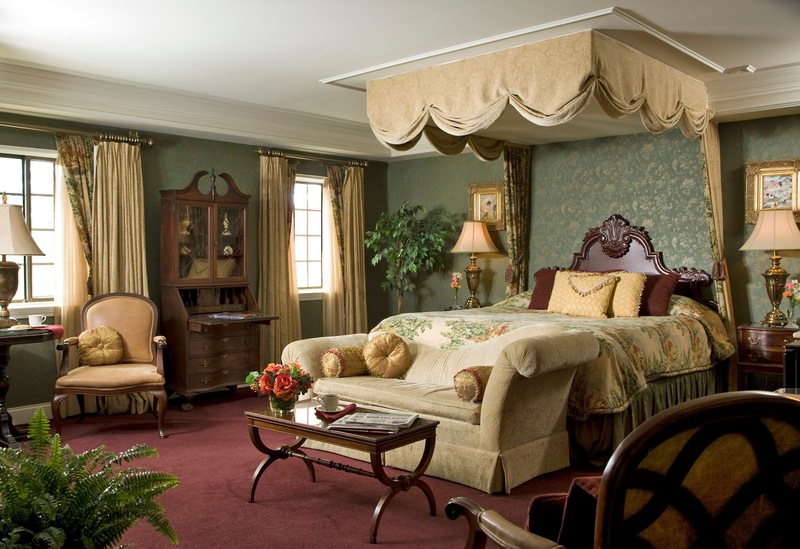 Well there are a lot of factors that make this one bedroom suite a favorite! First location, location, location. One item about the Red Coach Inn is there are three stories and no elevators, and the Sheffield is ideal because it is on the first floor in the front of the hotel! Not to mention the Sheffield is one of the few rooms that you can see the Upper Rapids and Goat Island from the bedroom. Since all of our rooms are different, some that face the Falls are designed where the living room or dining room will face the rapids, but when you stay in the Sheffield you can open the windows and listen to the roar of the rapids while you lay in bed. 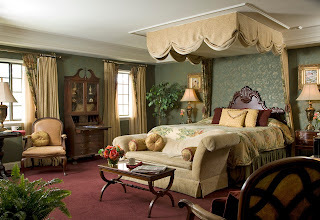 Besides the premium location the Sheffield is also one of three rooms in the hotel that have a canopy king size bed. 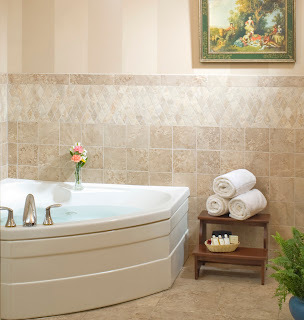 The rooms also boasts a gas fireplace, microwave oven, refrigerator, and whirlpool tub. Enjoy breakfast and the local newspaper in the restaurant each morning, along with all the other fabulous Red Coach amenities including telephone with voice mail and free long distance, free wireless Internet, coffeemaker, luxurious terrycloth bathrobes, Bose stereo, and Gilchrist & Soames amenities from England. We've got another beautiful summer week ahead of us here at the Red Coach Inn! Summertime is such a great time of year in Niagara Falls, at this week the outdoor activities and events are in full swing! From concerts to fairs to festivals it's all happening this week in Niagara Falls! This week's Tuesday concert will be performed by the American legacy the Doobie Brothers. They will be performing their latest release World Gone Crazy, and will feature special guests The Informers. Gates open at 4:30 pm and and the show starts at 6:30 pm. General Admission is $15 and Priority "Front of Stage" tickets are $25. For more information and to purchase tickets CLICK HERE. Head out to hear O.A.R for the Wednesday at Artpark concert of the week, featuring special guest openers Andrew McMahon and Allen Stone. O.A.R released their latest album, Live on Red Rocks, in July of 2012 and this 22 song album is the focus of their concert. Gates open at 4:00 pm and the show starts at 5:00 pm. General admission tickets are $10 and priority tickets are $25. For more information and to purchase tickets CLICK HERE. Come and experience jazz at its finest in an intimate and relaxed outdoor concert setting at the Gazebo at Hennepin Park. The Lewiston Jazz Project is a seven-piece group, under the direction of composer / pianist Ron Corsaro. This septet performs original as well as classic jazz repertoire, swing and modern jazz, accompanied by guest artists and student musicians. The concert is from 7:00 pm - 9:00 pm and this is a FREE event! For more information CLICK HERE. The Niagara Falls Culinary Institute is located on Old Falls Street in the heart of downtown and just steps from the beautiful Niagara Falls. Visit the Wine Boutique at the Culinary Institute on Thursday from 4:00 pm to 5:00 pm for free wine tastings. For more information CLICK HERE. Grab a blanket and share a bag of popcorn each Thursday night as Old Falls Street, USA turns into an open-air theater featuring free classic and contemporary movies under the stars. Food and beverage vendors will be available every week. This Thursday come and see The Hunger Games at 9:00 pm in the Old Falls Street's Middle Block. For more information CLICK HERE. There are over 90 wineries, 100 non-wine vendors, and numerous restaurants attending this year's annual wine festival! There will be live music, culinary classes, fireworks, and lots and lots of tasting. One Day Taster pass: Advance - $30, Gate - $40, Two Day Taster pass: Advance $40, Gate - $50. For more information CLICK HERE. Saturday July 13th is a day packed full of activities at the Oakwood Cemetery. At 9:00 am join Master Gardener, John Farfaglia, as he leads us through Oakwood Cemetery's 10 acre site, as he points out interesting species of trees and bushes. Then at 10:00 am Warren Bates, from the Connecticut Street Armory Archivist, will present Oakwood Cemetery with a replica of the congressional Medal of Honor. 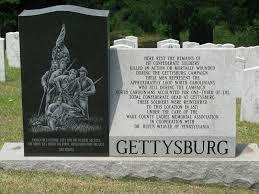 At 11:00 am Larry Steele, the Oakwood Cemetery Administrator, will take us on a street tour of the cemetery. Over 50 restaurant, 7 wineries, and 450,000 invited guests gather in downtown Buffalo to enjoy "fun by the forkful." One of the region's signature events, the Taste of Buffalo presented by TOPS is the largest two-day food festival in the United States. For more information CLICK HERE. 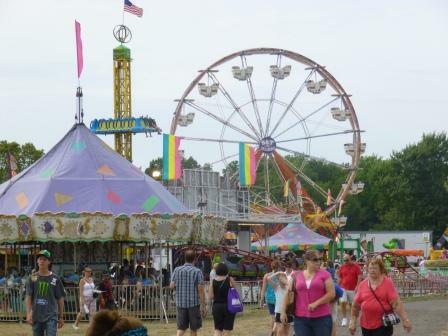 Head out to the Sanborn Fire Company Grounds for a weekend craft and county fair! 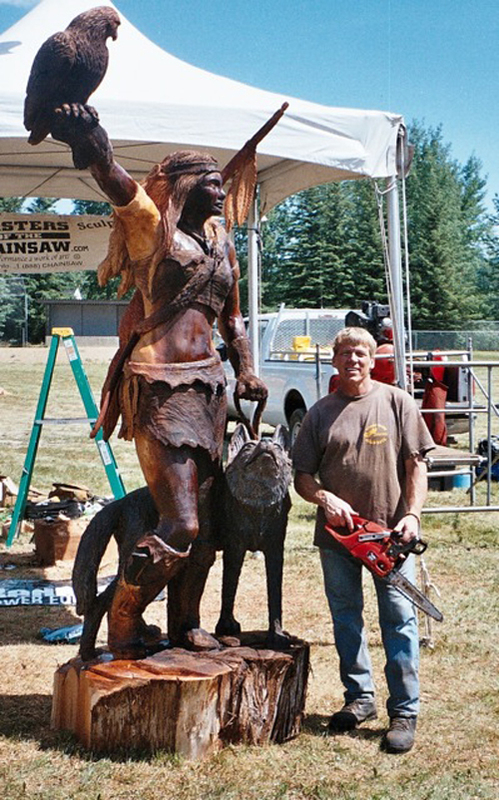 The Lewiston Council on the Arts is proud to present a Master of the Chainsaw artist during this weekend county fair. With engines screaming and sawdust streaming, watch a masterpiece be created before your eyes. 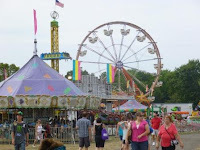 Enjoy the charm of this old fashioned county fair and craft show. 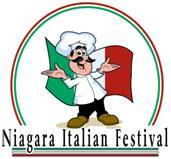 This is a FREE event sponsored by the Rotary Club of Niagara County Central from 10:00 am - 5:00 pm on the 13th & 14th. For more information CLICK HERE. Just minutes from the Red Coach Inn, the Niagara Wine Trail is one of my favorite ways to experience Niagara Falls. The wine trail has recently been regarded as the new up-and-coming region, but the art and science of wine-making has been in our area for many years. 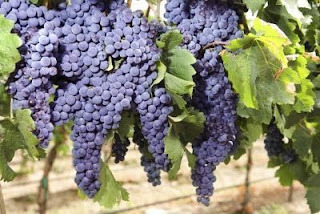 Niagara Landing Wine Cellars, a winery on the trail, produces fruit from vineyards that are over one hundred years old. The Niagara Wine Trail is nestled between the Niagara Escarpment and Lake Ontario, and the first winery is about a 30 minute drive from the Red Coach Inn. As you drive along the trail you'll see some amazing plantation style homes, the Niagara Gorge, antique stores and tons of picturesque scenery. You can also purchase a Niagara Wine Trail passport to get stamped at each vineyard to receive a special discount. I personally enjoy the Niagara Wine Trail so much because the wineries along the trail grow many varieties of grapes including Pinot Nior, Chardonnay, Riesling, Cabernet Sauvignon, Cabernet Franc, Syrah, and Merlot. There are also vineyards that produce unique styles of wine such as ice wines, fruit wine, and sparkling wines. 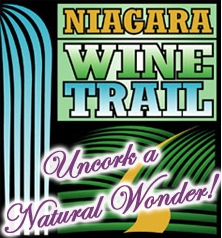 This huge variety of different wines makes the trail a great way to taste Niagara Falls. Whether I go with my friends or family there is a wine that will please anyone's palate. The different grape varieties and wine-making styles isn't the only factor adding to the uniqueness of each vineyard, the ambiance changes from stop to stop. Some vineyards boast a new age modern look to their tasting rooms, where others pride in their traditional appearance. 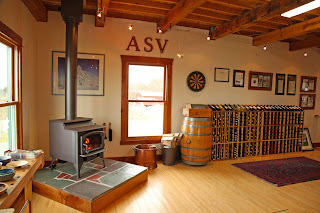 For example, Freedom Run Winery has beautiful hand-blown glass displayed all over their bar, where Arrowhead Springs Vineyard features elegant woodwork throughout their tasting room. Most vineyards also partner with local artists and farmers, adding to the diversity of their tasting rooms. You can enjoy browsing through hand-made pottery, glass, paintings, and locally produced jellies, jams, spices, and sauces. Who doesn't love shopping and sipping wine? Whether you prefer sweet wines, fruity wines, or something a little more tannic the Niagara Wine Trail offers a bit of everything. It's one of my favorite ways to spend a day, and I would highly recommend you hitting the road and start tasting!